An oil chief has revealed how the special forces regularly stormed rigs in the North Sea for anti-terror training. Balaclava-wearing commandos from the Special Boat Service (SBS) would slide down ropes and ladders from helicopters, while divers climbed platforms from fast boats or submarines. Details of the top secret operations have been recalled by Brian Cavan, former marine, aviation and logistics manager for BP. He told the Press and Journal that installations in the Beatrice oilfield, 14 miles off the coast of Helmsdale, were used by the SBS three times a year in the 1990s, for a maximum of 21 days each time. Military chiefs also signed a contract with BP in December 1996 to use the Beatrice platforms for 15 years after oil production ceased. The deal was approved by the Department for Trade and Industry in 2004 but later terminated by the Ministry of Defence (MoD). 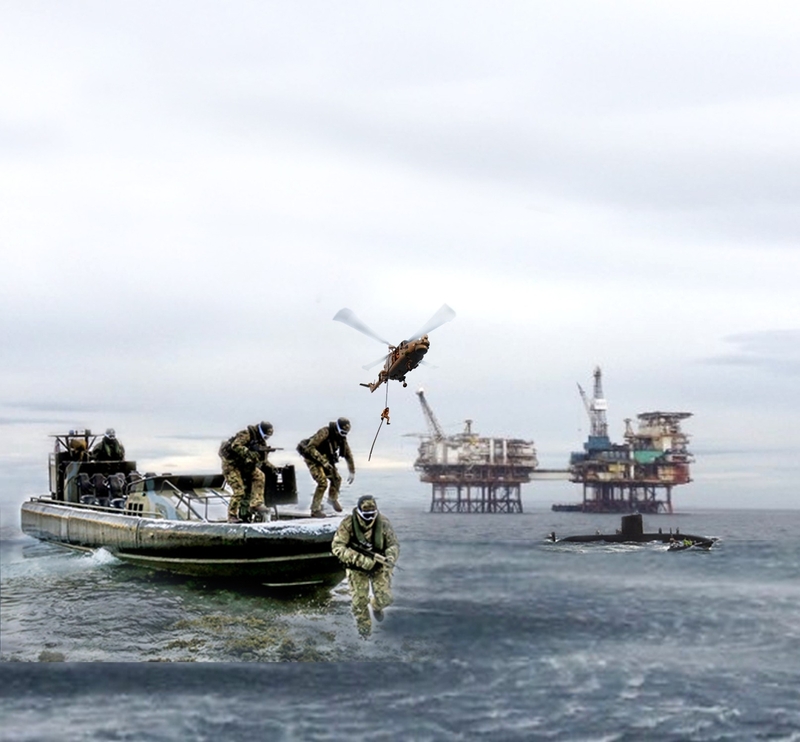 Mr Cavan, who is now based in Stonehaven but worked at Beatrice for three years while the training exercises took place, said BP would supply the special forces with platform plans ahead of the exercises. He said: “The Special Boat Service would do exercises on the platforms three times a year. They were doing this when the platforms were active. “Basically, if terrorists got on board, the SBS trained in various ways to get on board the platform. It was always about subduing terrorists. “They would come in with the helicopter and came down on ropes. At the same time they would come out to sea by fast boat or submarine and climb up the installation and into the superstructure, in daylight and at night. “They would then have people on the platforms playing ‘goodies and baddies’. We are talking between 12 and 20 of them. One source also suggested that US Navy Seals occasionally took part in the joint exercises at Beatrice. Documents shared with Mr Cavan revealed that he hosted various MoD chiefs on their site visit to the Beatrice oilfield in February 1995. Among the guests were Colonel Malcolm Mason, Royal Marines chief of staff, and Naval staff secretariat Geraldine Tucket. The documents also show that he attended an open day in Southampton in October 1996, in which he met shipping chiefs from companies such as P&O and Cunard, to gain insight into the training done by the Royal Marines on their vessels. The contract was subsequently transferred to Talisman when BP sold the Beatrice, Buchan and SWOPS fields. Mr Cavan, who still works in the oil industry, said he has “no idea” if the special forces still use platforms elsewhere. Defence commentator Tim Ripley said that this kind of military training went as far back as the Cold War period to prepare for a potential attack by the Soviet Union’s special forces. He added that the point of troops arriving by air and sea simultaneously would be to “confuse the enemy”. A decommissioning programme for Beatrice to re-use the platforms for military training after production ceased was approved by the department of trade and industry in 2004. But the MoD subsequently exercised their right to terminate the agreement, resulting in an update of the decommissioning programme. The details of the special forces operations have emerged following the publication of an environmental impact scoping report which highlighted new options to decommission Beatrice oilfield. Energy company Repsol Sinopec Resources UK (RSRUK) will soon start plugging and abandoning wells in the oilfield as it prepares to remove the three main platforms, two demonstrator wind turbines and cables. These operations could take place between 2024 and 2027.